Are you looking for the best managed WordPress hosting provider? Want to decide between Liquid Web and WP Engine? Both Liquid Web and WP Engine are 2 leading managed WordPress hosting provider. 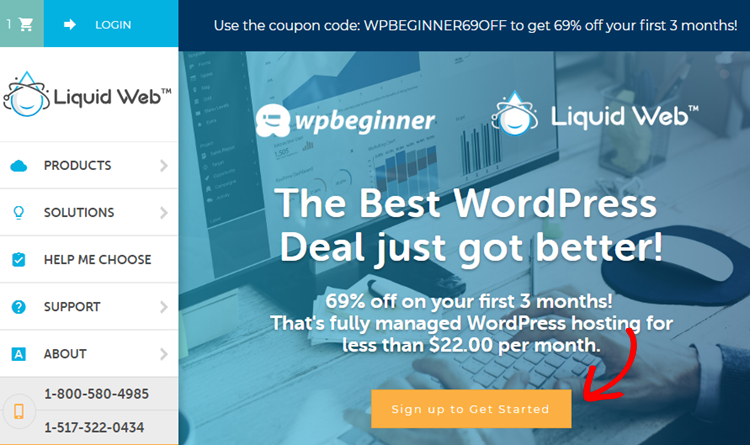 In this article, we’ll compare between WP Engine and Liquid Web so you can decide which one is best suited for your budget and needs. Both WP Engine and Liquid Web are managed hosting companies. While WP Engine is solely focused on WordPress-centric managed hosting, Liquid Web offers managed hosting for custom solutions and applications. The key difference between the WordPress hosting services of WP Engine and Liquid Web is that WP Engine offers hosting solutions for all sizes and budget, whereas Liquid Web is targeted at high-traffic volume websites. To test whether Liquid Web and WP Engine actually live up to their hype, we decided to analyze their page speed and uptime guarantees by signing up with each of them and creating 2 test sites. According to our Pingdom’s website speed test, our WP Engine test site only took 582 ms to load, which is faster than 96% of all tested sites. Liquid Web, on the other hand, took 901 ms to load, which is faster than 91% of all tested sites, yet slower than our WP Engine test site. Then we conducted a test on each hosting servers with Load Impact. Both WPEngine and Liquid Web, performed consistently throughout the test. The number of live visitors on the site doesn’t have an impact on the server performance. We also used Bitcatcha to record server response time of our hosting servers from 8 different geographical locations: New York, LA, London, Brazil, India, Singapore, Japan, and Australia. The speed for each location is measured three separate times, and then the results are averaged. As you can see, while our WP Engine site was rated A by Bitcatcha, our Liquid Web site was rated C+. Since WP Engine is a managed WordPress hosting solution, you can rest assured that your server will be optimized for blazing fast loading time without having to worry about server optimization. You’ll have peace of mind while focusing on what you’re really good at: publishing content and marketing your site. To avoid plugin conflicts, you’re not allowed to install certain plugins on WP Engine platform, including performance and security plugins. In fact, there’s a bit of learning curve to tackle before you can use WP Engine. With every Liquid Web plan, excluding managed WordPress hosting, you’ll get access to cPanel/WHM or Plesk. 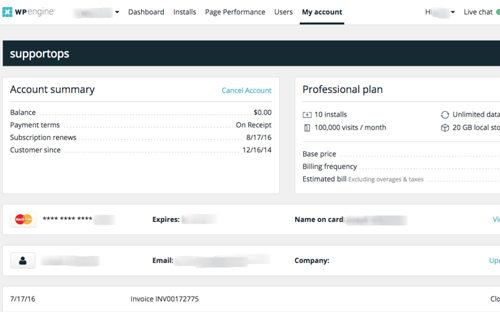 With Liquid Web’s managed WordPress hosting plan, you’ll get access to iThemes Sync Pro. It helps you manage all sites you run from a single location. With iThemes Sync Pro, you’ll be able to monitor uptime and downtime, track SEO status of your content, and control what your clients see in WP-admin. Below are a few unique features of WP Engine. Free access to StudioPress themes: You’ll get full access to 35+ high-quality StudioPress themes without extra cost. 1-click tool: You’ll also get a 1-click tool for setting up development, production, and staging environments. Geo-targeted personalization: Easily personalize your content based on geographical location and needs of your audience. WordPress core updates: No need to worry about staying up-to-date because WP Engine has got you covered. High performance guaranteed: WP Engine platform is powered by Amazon Web Services and Google Cloud Platform to ensure high performance. Now let’s take a look at some unique features of Liquid Web. Auto-plugin updates: Unlike WP Engine, Liquid Web provides automatic plugin updates, in addition to automatic WordPress core updates. Stencil: Save time while creating new sites by using the same plugins and themes for multiple sites. Built-in image compression: Boost your page speed with built-in image compression. 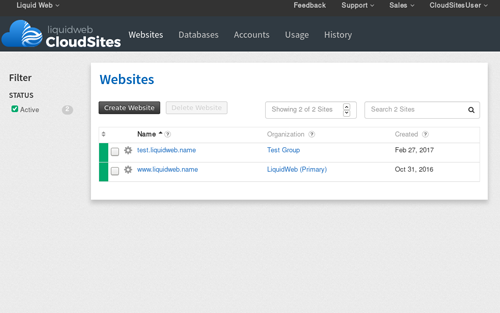 Auto-daily backups: Liquid Web takes daily backup and stores it for 30 days. Easy staging: You can easily create staging site, which allows you to test your codes before deploying it to the live site environment. To compare the features, let’s take a closer look at the features of WP Engine and Liquid Web. WP Engine provides a set of features that help you streamline your content publishing and marketing processes. However, Liquid Web is focused on delivering super fast web experience. Liquid Web even provides automatic plugin updates, so you can have a peace of mind, knowing your site Is hosted on a trustable platform. With the starter plan, WP Engine offers live chat support only. Phone support is provided with their higher plans. And ticket-based support is provided with their custom dedicated server plans. Unlike WP Engine, Liquid Web provides technical assistance via 3 modes: phone call, live chat, and emails. If you reach out via phone or chat, they’ll respond in under a minute, and if you reach out by email, you’ll get a response in less than 30 minutes. Both WP Engine and Liquid Web have robust knowledge bases on their sites that guide their customers to use their platform easily. The regular price for WP Engine starts at $35 per month. We’ve negotiated a deal with WP Engine, so our users will get a 20% discount on WP Engine, meaning you only need to pay $28 per month. Liquid Web’s regular pricing starts at $99 per month, which is quite a lot when you’re starting out. We’ve also negotiated a deal with Liquid Web as well. For first 3 months, you’ll get 69% off. That’s fully managed WordPress hosting for as low as $21.39 per month. We believe that WP Engine is a better hosting provider than Liquid Web thanks to their affordable hosting plans. With WP Engine, you get everything you need to build your WordPress site from scratch, including free access to 35+ premium StudioPress themes, 1-click tools to manage your site, and more. WP Engine has also partnered with Google Cloud Platform and Amazon Web Services to provide blazing fast web hosting experience. 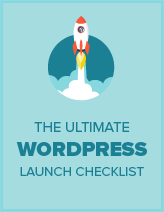 We hope this article helped you find the best managed WordPress hosting provider. If you liked this article, check out our WP Engine review and Liquid Web review.